Every four years, the Maccabiah Games, the world's third largest sporting competition following the Olympics and FIFA, are held in Israel. Also called the Jewish Olympics, the games date back to 1932, when they were first held in the then British Mandate of Palestine with 390 Jewish athletes competing from 14 different countries. This year the quadrennial sports competition is hosting 9,000 athletes from 78 countries, some of whom have traveled from the most remote Jewish communities in the world to take part in the historical competition. Among the 78 delegations, there are 21 nations participating for the first time in the history of the Maccabiah Games, with a tennis player from Mongolia, and athletes from Nicaragua, Ecuador and Cuba. The Jewish athletes from those respective countries among others were able to compete in the faraway Jewish state thanks to two Jewish visionaries, Jeffrey Sudikoff of Los Angeles and Macabi Carasso of Israel. 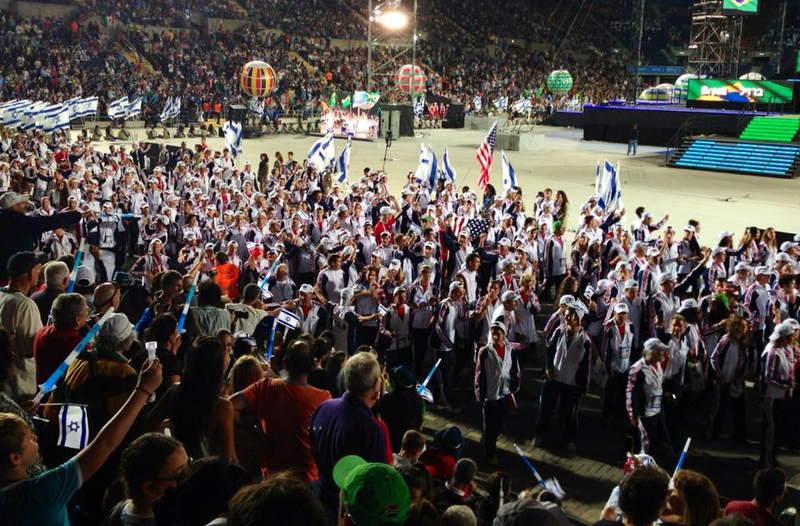 Photo Credit: Arsen Ostrovsky, Tazpit News Agency / Description: Opening ceremony for Maccabiah Games with Team USA in the background. According to a JTA report, Sudikoff, a venture capitalist, realized that there were a surprising number of countries where Jewish people resided that did not compete in the games after attending the 2009 Maccabiah Games. He then proposed to the Maccabi World Union, the international Jewish sports organization formed in 1921 that organizes the Maccabiah, to bring Jewish athletes to the games from countries that had never participated during the 81 years of the sports competition. With Sudikoff funding the project called Small and Lost Communities, a 61-year-old Israeli aptly named Macabi Carasso, set out on a mission to recruit Jewish competitors. Carasso, whose family immigrated from Salonika to Israel in 1924 and established a successful automobile-import business, traveled to 18 countries in the past two years looking for athletes. Visiting a number of remote places in Latin America, the Caribbean, and countries of former Yugoslavia, among others, Carasso discovered areas with tiny Jewish populations. "What we're looking for in these communities is not a super-athlete -- someone who jumps the highest or is a tennis champion -- but to create a link between these communities and the Jewish world," Carasso told the JTA. Indeed, the Maccabi World Union is the largest and longest running Jewish sports organization spanning over five continents, with more than 60 countries, 450 clubs, and 400,000 members worldwide. As a Zionist organization, the primary goal is to utilize sports as a means to bring Jewish people of all ages closer to Judaism and Israel according to the organization's website. Its signature event, the Maccabiah Games, highlights the organization's message of unity and continuity. That message was certainly highlighted for the 55-member delegation from Cuba, as noted in an article by the New York Times. Although Cuba has no diplomatic relations with Israel, the official delegation of Jewish athletes and coaches were able to visit because of recently relaxed travel restrictions for large groups departing from Havana according to the Times. There are approximately 1,500 Jews living in Cuba and hundreds have immigrated to Israel in the last few years. The Gonzalez siblings are from Cienfuegos on the Cuban coast, a city of 150,000 whose Jewish population in is 25 people. Rafael, 24 and his sister, Roxana, 25, are competing in archery. Others like Andrew Szabo of the West African nation Guinea-Bissau, one of two delegations representing Africa in this year's Maccabiah, sees the games as an ideal way to unite Jews across the world. "I think the Maccabiah is the ultimate form of Jewish unity," he told the Times. "It's not a cutthroat competition, but about getting together, the camaraderie."